Joseph L. Druce is a convicted murderer who killed John Geoghan, the former Roman Catholic priest who was convicted of sexually abusing children, and who had also been at the center of the Catholic sexual abuse scandal. 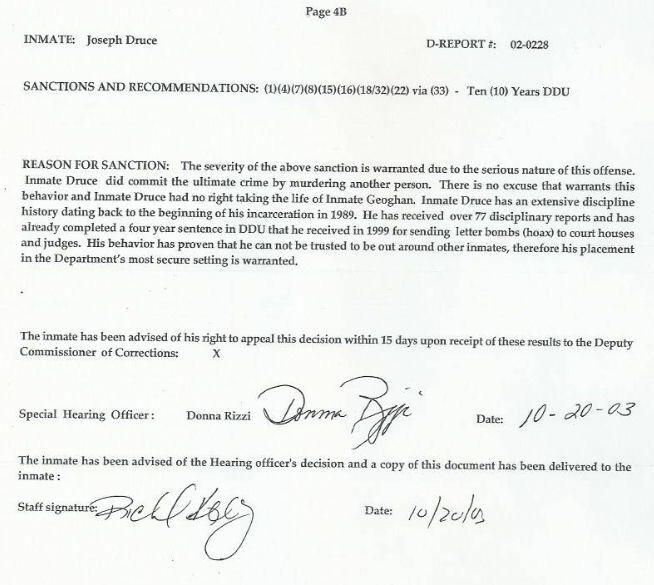 In August 2003, while in protective custody at the Souza-Baranowski Correctional Center in Shirley, Massachusetts, Geoghan was trapped in his cell by Druce, who jammed the door closed so Correction Officers could not reach him. Druce then strangled and stomped Geoghan to death. An autopsy revealed Geoghan's cause of death to be "ligature strangulation and blunt chest trauma." 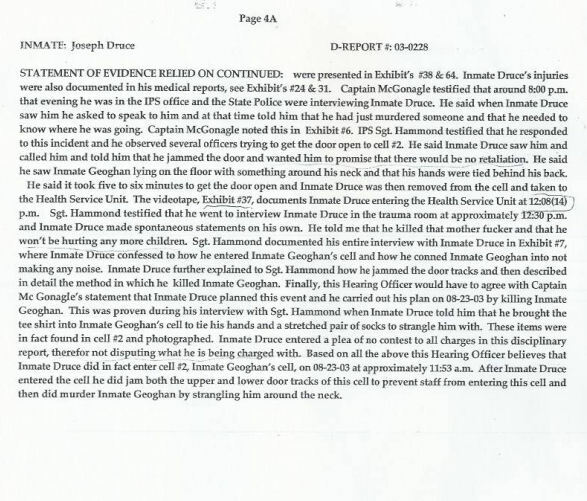 At the time Druce killed Geoghan, he was already serving life without possibility of parole for killing a man who allegedly made a pass at him after picking Druce up hitchhiking. In the interim between the two above crimes he had become a small sensation for sending fake anthrax to lawyers with Jewish names from prison. 75 pages of copies of legal documents in regards to the murder of John Geoghan and the resulting case against Joseph Druce. Many of these documents have never been seen by the general public. Druce has personally annotated and has added notes to many pages in black ink pen. These documents provide a look into the Geoghan murder that has not been widely seen by the public.